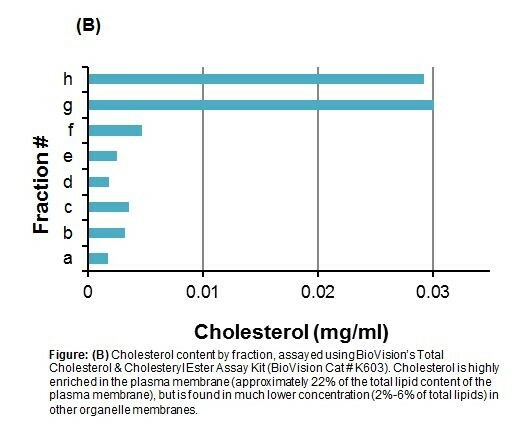 OrgFrontier™ Plasma Membrane Isolation Kit | K414| BioVision, Inc.
• Isolation of plasma membrane fractions from tissues and cultured cells. • Plasma membrane studies and plasma membrane protein profiling. Plasma membrane is one of the most studied cellular membranes. 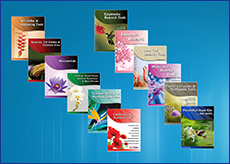 Prokaryotic and eukaryotic organisms possess plasma membranes which, in summary, enclose and protect the cytosol, and cellular organelles while communicating to their surroundings due to their semi-permeable characteristics. Plasma membranes are selectively permeable lipid bilayers: they allow nutrients and other metabolites to be transported into the cytosol and allow for export of cellular waste at the same time. Oxygen, CO2 and other gaseous or lipophilic small molecules freely diffuse across the plasma membrane; however, ions, amino acids and sugars follow strict passive and active cellular transportation mechanisms. The plasma membrane lipid bilayer is primarily composed of four phospholipids: phosphatidylcholine, phosphatidylethanolamine, phosphatidylserine and sphingomyelin. Phosphatidylinositol, a fifth phospholipid, is also localized in the inner side of the membrane. Additionally, many proteins are embedded or found adhered to both sides of the plasma membrane. For example, glycoproteins are usually found attached to the outer side of the membrane. BioVision’s OrgFrontier™ Plasma Membrane Isolation Kit provides a proprietary set of reagents and buffers designed to enable optimized extraction and isolation of intact plasma membrane from mammalian tissues and cells. 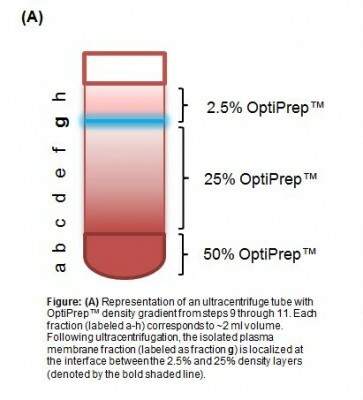 The protocol requires an ultracentrifuge to be performed and can be completed in a few hours.